The mixer also called a mixing console and mixing console, and in English the name of this unit sounds like a mixing console. It is an electronic equipment which is intended for the information of the audio signals by summing multiple sources into one or more outputs. The principle of operation is the routing of signals in the implementation of recording and mixing and sound reinforcement. Currently available devices are of two types – analog and digital, each has its supporters and opponents because of the availability of certain advantages and disadvantages. Mixers vary in the number of inputs and outputs they have, and professional equipment is at least 32 inputs, 6 tire type Aux, a very powerful equalizer input, 4 or more subgroups, the high-frequency or long stroke fader. The budget, Amateur compact devices are much fewer channels, less powerful equalizers, as well as the frequent absence of faders. In the modern music industry is allocated separately and the class of mixers designed for DJ work. 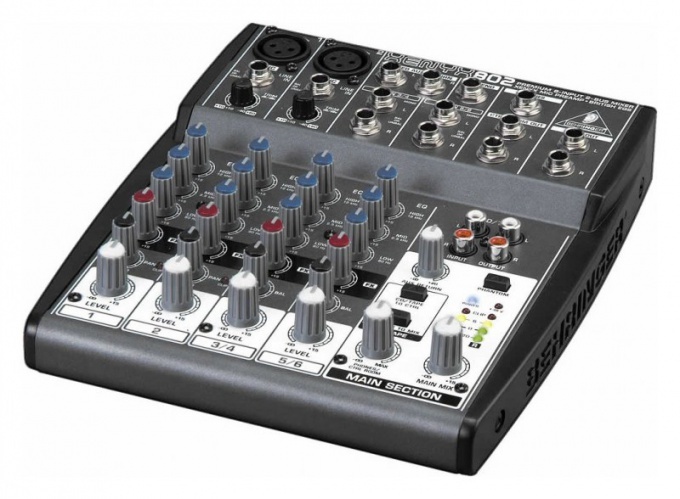 The difference mixer-DJ-remote from the traditional is the smaller number of input channels, one for microphone and two for stereo channels. Also have DJ devices has a crossfader, which the DJ can smoothly reduce the signal through the introduction channels, as well as using existing units for special sound effects. The mixer is used in almost all types of sound reinforcement and recording Studio, and concert equipment, and a transmitting device, as well as radio. Moreover, the professionals use so-called active mixers with built in amplifiers, ideal for work with a compact and portable audio sets. Some devices premium also equipped with electronic motor, and for all controller, so that the mixers can be controlled directly from the computer, and the console remains analog. At the same time, these mixers are commonly very expensive, which is their main drawback. A separate class of mixer device for large and powerful broadcasting studios and radio stations. They are usually equipped with components of high quality and with a high degree of reliability and modern faders, which are also called "telephone hybrids". Different hybrids by the presence of special cells, which converts the telephone signal into the audio sound necessary for operation of the radio Studio. And the cost of these mixers can reach tens and even hundreds thousand roubles.